Appearance: The shen ring is at first glance a circle with a horizontal line in a tangent along its bottom edge. However the shen is more than meets the eye. The shen was a stylized loop of rope with each end visible. Meaning: In many cultures, the circle was a symbol of "eternity." Such symbolism is evident in familiarities such as the wedding ring of Western cultures, the Gnostic ouroboras and the ying-yang of China. The same is true of the shen ring. Deriving its name from the root shenu (to encircle), it was almost always a symbol of eternity. However, the shen ring also held the idea of "protection." It most often carried this connotation when seen in its elongated variation, the cartouche; which surrounded the birth and throne names of the Pharaohs. 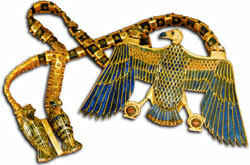 The shen frequently appeared depicted in the claws of the avian forms of the falcon-god Horus and various vulture goddesses. An example of this can be seen to the right. The shen was also depicted at the base of the notch palm branches held by the god of eternity, Heh.